For Find what, type the member name. Usually this returns a small number of classes to look at. You can determine which is the appropriate class by closer examination. For Search for, select All classes that define. For Type, select Method or other kind of class member. For Name, type the name of the class member to find. The search is case-sensitive. Sometimes you need to find all the subclasses of a certain class (for example, if you are rearranging the inheritances among your classes). The quickest way to do so is to open the class in the InterSystems Class Reference. The summary area displays a list of all the subclasses of your class. The macro could be defined within the code you are currently looking at or it could be defined in an INC file that your code uses (including the system include files provided by Caché). An INC file can include other INC files, and a class inherits all the INC files used by any superclass. To find the INC file that defines a macro, right-click the macro and select Goto macroname. Some of the macros supplied by Cache are documented in System-supplied Macro Reference in Using Caché ObjectScript. Select System Administration > Configuration > System Configurations > Local Databases. Select Create New Database to open the Database Wizard. Enter a database name in the text box. Usually this is a short string containing alphanumeric characters; for rules, see Configuring Databases in the Caché System Administration Guide. Enter a directory name or select Browse to select a database directory. If this is the first database you are creating, you must browse to the parent directory in which you want to create the database; if you created other databases, the default database directory is the parent directory of the last database you created. For additional options and information on creating remote databases, see Configuring Cache in the Caché System Administration Guide. Enter a Name for the namespace. Usually this is a short string containing alphanumeric characters; for rules, see Configuring Namespaces in the Caché System Administration Guide. For Select an existing database for Globals, select a database or select Create New Database. If you select Create New Database, the system prompts you with similar options as given in the previous topic. For Select an existing database for Routines, select a database or select Create New Database. For additional options, see Configuring Cache in the Caché System Administration Guide. When you map a routine to database ABC, you configure a given namespace so that Caché finds this routine in the database ABC, which is not the default database for your namespace. When you define this routine mapping, Caché does not move the routine (if it already exists) to the designated database; instead the mapping instructs Caché where to find the routine in the future. If the routine already exists, move it to the desired database as described in Moving Code from One Database to Another, later in this chapter. Select Routine Mappings in the row for the namespace in which you want to define this mapping. For Routine database location, select the database that should store this routine. Enter a value for Routine name. You can use the * character to choose multiple routines. Use the actual routine name; that is, do not include a caret (^) at the start. The routine does not have to exist when you map it (that is, it can be the name of a routine you plan to create). You can also define this kind of mapping programmatically. You can also define routine mappings programmatically; see the Routines entry in the InterSystems Programming Tools Index. When you map a package to database ABC, you configure a given namespace so that Caché finds the class definitions of this package in the database ABC, which is not the default database for your namespace. The mapping also applies to the generated routines associated with the class definitions; those routines are in the same package. This mapping does not affect the location of any stored data for persistent classes in these packages. Also, when you define this package mapping, Caché does not move the package (if it already exists) to the designated database; instead the mapping instructs Caché where to find the package in the future. If the package already exists, move the package to the desired database, as described in Moving Code from One Database to Another, later in this chapter. Select Package Mappings in the row for the namespace in which you want to define this mapping. For Package database location, select the database that should store this package. Enter a value for Package name. The package does not have to exist when you map it (that is, it can be the name of a package you plan to create). You can also define this kind of mapping programmatically. You can also define package mappings programmatically; see the Packages entry in the InterSystems Programming Tools Index. Caché includes a utility for creating pseudo-random test data for persistent classes. The creation of such data is known as data population, and the utility for doing this is known as the Caché populate utility. This utility is especially helpful when testing how various parts of an application will function when working against a large set of data. You can use the populate utility in two different ways. Add %Populate to the superclass list of your class. Optionally specify a value for the POPSPEC parameter of each property in the class. For the value of the parameter, specify a method that returns a value suitable for use as a property value. Write a utility method or routine that generates the data in the appropriate order: independent classes before dependent classes. In this code, to populate a class, execute the Populate() method of that class, which it inherits from the %Populate superclass. This method generates instances of your class and saves them by calling the %Save() method, which ensures that each property is validated before saving. If the POPSPEC parameter is specified for that property, the system invokes that method and uses the value that it returns. Otherwise, if the property name is a name such as City, State, Name, or other predefined values, the system invokes a suitable method for the value. These values are hardcoded. Otherwise, the system generates a random string. For details on how the %Populate class handles serial properties, collections, and so on, see The Caché Populate Utility in Using Caché Objects. Invoke your utility method from the Terminal or possibly from any applicable startup code. This is the general approach used for Sample.Person in the SAMPLES database. Write a utility method that generates the data in the appropriate order: independent classes before dependent classes. To do so, use a method of %Populate or %PopulateUtils or use your own method. Invoke your utility method from the Terminal. This is the approach used for the two DeepSee samples in the SAMPLES database, contained in the DeepSee and HoleFoods packages. During the development process, it may be necessary to delete all existing test data for a class and then regenerate it (for example, if you have deleted the storage definition). Where classname is the full package and class name. On the left, select the namespace in which you are working. On the right, select the check box next to the data global and the index global. The system prompts to confirm that you want to delete these globals. It is important to be able to reset storage during development, but you never do this on a live system. The action of resetting storage for a class changes the way that the class accesses its stored data. If you have stored data for the class, and if you have removed, added, or changed property definitions, and you then reset storage, you might not be able to access the stored data correctly. So if you reset storage, you should also delete all existing data for the class and regenerate or reload it, as appropriate. In Studio, display the class. Scroll to the end of the class definition. Select the entire storage definition, starting with <Storage name= and ending with </Storage>. Delete the selection. If the Inspector is not currently displayed, select View > Inspector. Typically there is only one storage definition, named Default as shown here. Right-click the line for the storage definition and then select Delete. Select System Explorer > SQL. If needed, select Switch in the header area to select the namespace in which you are interested. 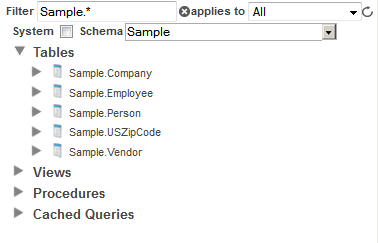 Optionally select an SQL schema from the Schema drop-down list. This list includes all SQL schemas in this namespace. Each schema corresponds to a top-level class package. Select the name of the table. The right area then displays information about the table. The first column (#) is the row number in the display. These numbers happen to be the same in this case because this table is freshly populated each time the SAMPLES database is built. In a real application, it is possible that some records have been deleted, so that there are gaps in the ID values and the numbers here do not match the row numbers. For the drop-down liist, select Display Mode, Logical Mode, or ODBC Mode. This controls how the user interface displays the results. Where namespace is the desired namespace. Where package.class is the package and class, and ID is the ID of a stored object in the class. Where propname is the property whose value you want to see. To view globals in general, you can use the ObjectScript ZWRITE command or the Globals page in the Management Portal. If you are looking for the global that stores the data for a class, it is useful to first check the class definition to make sure you know the global to view. Find the <DefaultData> element. The value between <DefaultData> and </DefaultData> is the name of the global that stores data for this class. Caché uses a simple naming convention to determine the names of these globals; see Globals Used by a Persistent Class, earlier in this book. However, global names are limited to 31 characters (excluding the initial caret), so if the complete class name is long, the system automatically uses a hashed form of the class name instead. In the Management Portal, select System Explorer > Globals. Usually most non-system globals store data for persistent classes, which means that unless you display system globals, most globals will have familiar names. Select View in the row for the global in which you are interested. The system generates INT code for each routine and each class you compile. Select the Compiler > General Flags tab. Select the Keep Generated Source Code option. Also see System Qualifiers and Flags, earlier in this book. Display the routine or class in Studio. If you changed the Keep Generated Source Code option, recompile the routine or class. Select View > View Other Code. If there are multiple generated routines, Studio displays a dialog box where you choose the routine to view. Otherwise it displays the generated routine. Some methods, routines, and subroutines are simple enough to be implemented in the kernel. There is no generated .INT code for such items. Also see Documents (Files), earlier in this book. In the Management Portal, you can test a query that your code will run. Here you can also view the query plan, which gives you information about how the Query Optimizer will execute the query. You can use this information to determine whether you should add indices to the classes or write the query in a different way. For the drop-down list, select Display Mode, Logical Mode, or ODBC Mode. To test the query, select Execute. To see the query plan, select Show Plan. When you first execute an SQL statement, Caché optimizes the query and then generates and stores code that retrieves the data. It stores the code in the query cache, along with the optimized query text. Note that this cache is a cache of OBJ code, not of data. Expand the Cached Queries folder. Select the Tables link in the row for the schema. At the top of the page, select Cached Queries. Each item in the list is OBJ code. By default, Caché does not save the routine and INT code that it generates as a precursor to this OBJ code. You can force Caché to save this generated code as well. See Settings for Caché SQL, earlier in this book. You can purge cached queries (which forces Caché to regenerate this code). To purge cached queries, use Actions > Purge Cached Queries. For Caché classes, indices do not require any maintenance, with one exception: if you add an index after you already have stored records for the class, you must build the index. In the left area, select the table. Select Actions > Rebuild Indices. This information is available only if you have run the Tune Table facility with the given table or tables. This facility calculates this data and stores it with the storage definition for the class, as the <ExtentSize> value for the class and the <Selectivity> values for the stored properties. Select Actions > Tune Table. For <Selectivity> values, it is not necessary to do this again unless the data changes in character. For <ExtentSize>, it is not important to have an exact number. This value is used to compare the relative costs of scanning over different tables; the most important thing is to make sure that the relative values of ExtentSize between tables are correct (that is, small tables should have a small value and large tables a large one). The Tune Table facility is a tool for use during development, not for ongoing maintenance. That is, there is no need to rerun it as part of administrative tasks. In Studio, go to a namespace that contains the code. Right-click each class, package, or routine that you want to move and select Add to Project. Open the Workspace window and select the Project tab to make sure all the desired items are displayed. Specify the file into which you wish to export the project. Either enter a file name (including its absolute or relative pathname) in the field or select Browse and navigate to the file. This creates an .xml file. The format of the file is not documented, but it is fairly easy to read. Select Tools > Import Local. Navigate to and select the .xml file. Studio now displays a list of the code items in this file. Select each item that you want to import. Go back to the first namespace and delete the code. Identify the globals that contain the data and its indices. 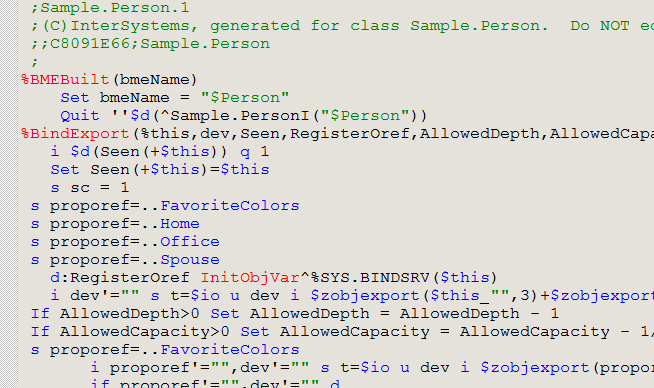 If you are not certain which globals a class uses, check its storage definition. See Storage, earlier in this book. Select the globals to export. Specify the file into which you wish to export the globals. Either enter a file name (including its absolute or relative pathname) in the field or select Browse and navigate to the file. The globals are exported to a file whose extensions is .gof. Specify the import file. Either enter the file name or select Browse and navigate to the file. Select Next to view the contents of the file. The system displays a table of information about the globals in the specified file: the name of each global, whether or not it exists in the local namespace or database, and, if it does exist, when it was last modified. Choose those globals to import using the check boxes in the table. Create a copy of the class and delete the original. For Copy Class Definition From, select the original class. This value is initialized with the name of the class that you are currently viewing. For To, specify a new full class name. Optionally select Replace instances of Class Name. This replaces instances of the class name within code in the copied class. It does not affect other classes, and it does not affect comments. Export the class from Studio, edit the XML file, reimport it, and then delete the original class. The class definition might include additional references to the class name, which you would also change. Update references to the old class. Use Ctrl+Shift+f to find references to the old name. Caché System Administration Guide describes how to use most of the Management Portal. This book includes information on configuring the Caché server, creating namespaces and databases, and creating mappings. Using Studio describes how to use Studio. Using the Terminal describes how to use the Terminal. Using Caché SQL includes more information on building indices, building indices programmatically, and using the Tune Table facility.